Professor Haim Bresheeth is a filmmaker, photographer and a film studies scholar, retired from the University of East London, where he worked since since early 2002. He now teaches at the School of Oriental and African Studies (SOAS). His books include the best-selling Introduction to the Holocaust (with Stuart Hood, 2 reprints since 1997), the first version was titled Holocaust for Beginners (1993) and was also reprinted a number of times; This title was also published in Turkish, Croatian and Japanese translations, and is being translated into other languages. His edited volumes include The Gulf War and the New World Order, (with Nira Yuval-Davis) published in 1992 by Zed Books, Cinema and Memory: Dangerous Liaisons, Co-edited with Sand, S and Zimmerman, M, Zalman Shazar Centre, Jerusalem (Hebrew) 2004, and a co-edited volume with Haifa Hammami The Conflict and Contemporary Visual Culture in Palestine & Israel, special double-issue of Third Text on Palestinian and Israeli Art, Literature, Architecture and Cinema. He has been on the Editorial Board of the Journal Khamsin for many years until its demise in 1991, and has published widely in Hebrew and English on Palestinian and Israeli film, and is currently working on the representation of the other and stranger in European film. 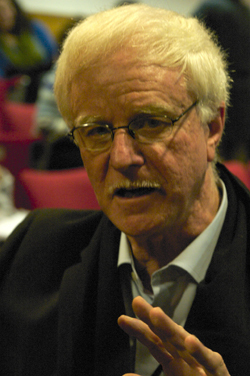 His films include the widely-shown State of Danger (1989, BBC2) – a documentary on the first Palestinian Intifada. He has also written many newspaper articles in Hebrew, mainly published in the Israeli Ha’aretz broadsheet, as well as English language articles, mainly published by the Cairo-based Al-Ahram Weekly. Since 2001, he served as Professor of Film Studies and Chair of Cultural and Media Studies at the School of Humanities and Social Sciences, University of East London. He was Director of the new UEL research centre – Matrix East Research Lab – concentrating on the Digital Arts and Cybercultures. Before coming to UEL, Prof. Bresheeth was Dean of the School of Media, Film and Cultural Studies, at Sapir College, Israel. Has founded and chaired the Sderot Cinemateque in southern Israel, and its Cinema South film festival, still running successfully today. In 2001 was the Chair and writer of the special Report on Public Broadcasting in Israel, commissioned by the Ministry of Culture and Sport, and published in 2001, with the government accepting all its recommendations, only to avoid putting them into practice. In 2010 he set up the Museum Integrated Digital Archiving System at the University of East London, a centre for High Resolution scanning of artworks, which can be gleaned on MIDAS. In 2012, completed the film London is Burning, on the August 2011 London Riots.